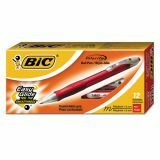 BIC Velocity Retractable Ballpoint Pen, 1mm, Red Ink, Translucent Red Barrel, Dozen - Retractable ballpoint pens deliver comfort and performance all in one. Quality ink is quick-drying and smooth writing. 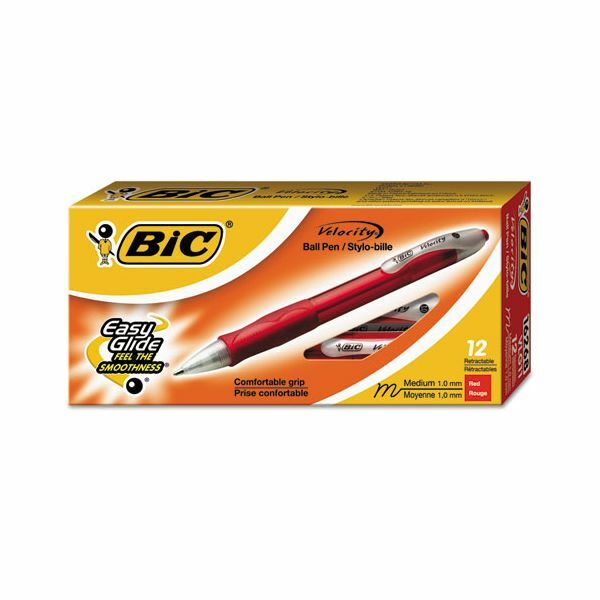 Bic's exclusive ink system technology, Easy Glide, deliver smoother writing. Tungsten carbide ball is a perfect sphere and very resistant. The medium point delivers a 1.0mm line width. Contoured rubber grip gives you comfort and control. Semi-translucent barrel matches the ink color. Plastic clip attaches pen to notebooks or day planners. 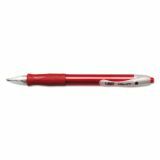 Ballpoint pens are refillable.